Muharraq, Bahrain, 2015-11-5 — /Travel PR News/ — Under the patronage of His Excellency Mr. Ahmed Al Nemah, Acting Undersecretary for Civil Aviation Affairs at the Ministry of Transportation and Telecommunications, Bahrain Airport Company (BAC) hosted the ICAO Seminar on Airport Collaborative Decision Making (A-CDM) at the Moevinpick Hotel in Muharraq. The seminar was conducted by a team of experts from ICAO and other international organizations lead by Mr. Mohamed Khonji, Regional Director of ICAO Middle East Regional Office. The seminar is the first of its type to be organized by ICAO in the Middle East Region and the second worldwide. Airport Collaborative Decision Making (A-CDM) is a relatively new concept which aims at improving Air Traffic Flow and Capacity Management (ATFCM) at airports by reducing delays, improving the predictability of events and optimizing the utilization of resources. Implementation of A-CDM will enhance surface operations and safety by making airspace users, ATC and airport operators better aware of their respective situation and actions on a given flight. Commenting on this initiative, BAC’s Chief Airport Operating Officer, Mohamed Thamir Al Kaabi, explained that “Within an airport setting where time is of essence, efficiency is paramount. By adopting a structured communication system across key airport partners, we can ensure common situational awareness and better decision making; this in turn will help us anticipate key areas of concern and develop preemptive solutions to enhance the flow of air traffic and improve the overall travel experience. BAC is proud to be hosting such significant aviation initiatives that aim to strengthen collaborative efforts among strategic partners and ultimately improve airport efficiency. Bahrain International Airport is well recognized for its operational efficiency and the ACDM is an ideal tool to help us enhance this strength. This program has been successfully implemented across major airports worldwide and we look forward to sharing a similar success story at BIA”. The Seminar was attended by a group of aviation specialists from the Middle East States, ICAO, IATA, CANSO, Airbus, ACI, Eurocontrol, DFS, Munich Airport, Bahrain’s Ministry of Transportation and Telecommunications’’ Civil Aviation Affairs and Bahrain Airport Company. 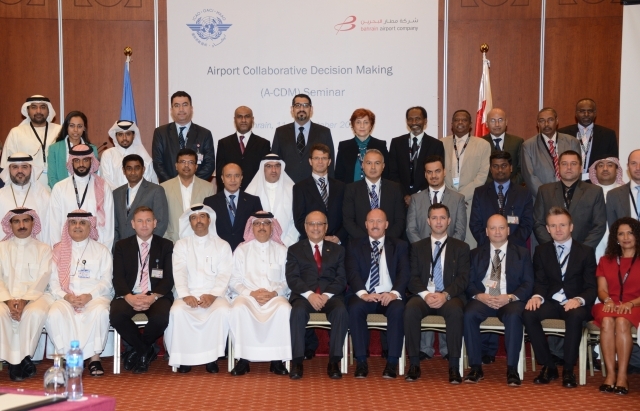 This entry was posted in Airports, Business, Transportation, Travel, Travel Management, Travel Services, Travelers and tagged A-CDM, BAC, Bahrain Airport Company, ICAO Seminar on Airport Collaborative Decision Making, Mohamed Thamir Al Kaabi. Bookmark the permalink.